If you own a hair salon or a barber shop, your primary goal is surely the complete satisfaction of your dear customers. One way of achieving that, along with an excellent professional service, is having all the appliances and equipment that you need. Having the right set of tools can greatly influence the outcome of any haircut or hairstyle that you do and make a big difference. One of the must-have tools that any professional salon should have is, of course, a cleaning brush. Dusters have been used for many years and all of us have seen it as one of the main tools of traditional barbers, at least in movies. Our professional neck brush comes in black and silver color with a 3.5 x 17.5 cm handle that is very easy to grip and makes the duster very easy to handle and use. It fits perfectly in your hand and allows you to move it around freely because it is ergonomically designed. Because of the shape of the handle, the brush can also stand up on its own which makes it always available for you from your working station. But you can also place it in your brush holder when you’re not using it. The colors, black and silver, are very simple and will fit into any salon. If you’re into everything matching and being perfectly color coordinated in your salon, then you will be thrilled by this brush because it looks great next to all kinds of colors and styles. The brush head is made out many small fibers and is 10 cm wide. 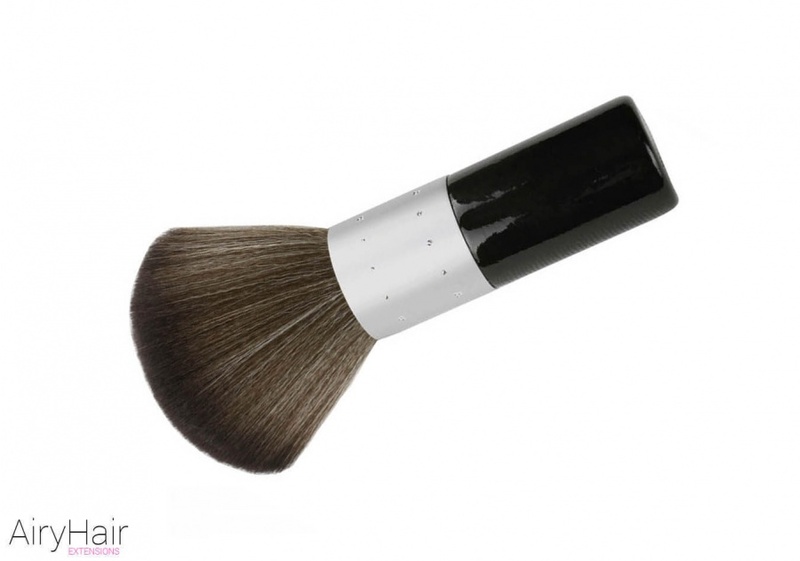 It has a mushroom shape, or what is commonly known as a kabuki brush. 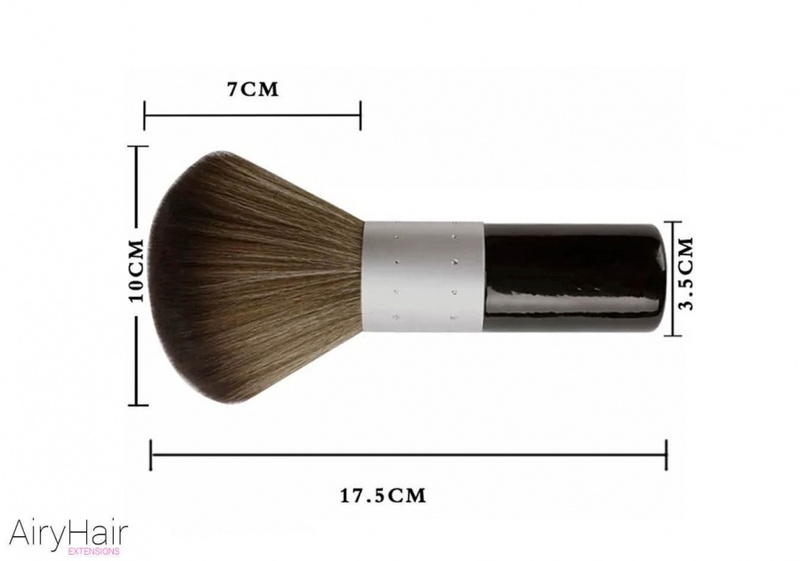 It has very dense bristles that are very gentle for the skin and your clients will definitely love the feel of this brush on their necks. The big fluffy brush will collect and remove all of the hairs with ease. Apart from using it after a haircut, it can also be used after a shave or to apply powder to the skin. Many other dusters can be very itchy and uncomfortable on the skin, but that’s definitely not the case with our brush because it has gentle and delicate bristles that will gently massage the skin. You may have also experienced shedding problems with many dusters and that can be a real problem. The whole point of a brush is to remove the hairs, not have more of them around. And of course, as the bristles fall off, the brush becomes less and less effective and not producing good results. With proper use, we can assure you that our cleaning brush will stay intact and you will not notice excessive shedding. That also means that you will be able to use it for a very long time and not have to replace it constantly. How to Use a Barber Cleaning Brush? Barber brushes fall into the category of basic and simple equipment, but are definitely indispensable and necessary. Dusters are used to clean any hairs that have fallen on the customer’s neck, ears or face during a haircut. This most often happens with male clients or female clients who have short hair. Apart from hair salons, it is one of the most important tools of any barber shop, whether it’s modern or traditional. The way a cleaning brush is used is by holding onto the handle and gently brushing in light, circular motions in order to remove any hair residue. Don’t brush too aggressively because the hairs will fly all over the place, and it might not be comfortable for your client’s skin. Make sure to be very gentle and careful while using the brush. For the best results, it is important to use a bit of powder with the brush. The small hairs often get stuck to the skin because of sweat and it’s sometimes very hard to remove them. By putting some powder on your neck duster, the hairs come off right away and you don’t have to brush as much and irritate the client’s skin. If you use the brush correctly, it may actually be a great experience for your customer as the light bristles can be very pleasant on the skin. How to Clean a Barber Brush? Keeping a high level of hygiene is also very important for every hair salon and barber shop. You don’t want to use the same tool on multiple customers without properly cleaning it. That goes for brushes as well. Since neck dusters are in constant contact with skin, they can become unsanitary if they’re not clean. You want your customers to feel safe and know that you keep a high level of cleanliness and that all the products and tools are not dangerous in any way. There are many sanitizing products that you can spray on your duster that will make it clean and sterile. You simply need to apply it and leave it for a couple of minutes in order to dry and your brush is ready to be used again. It is a very simple and quick process that will make all the difference. And your client will definitely be happy to see that you’re doing everything possible in order to provide the best experience for them. At the end of your shift, you can also wash it with water and cleaning products and leave out to dry overnight. That will clean it thoroughly and it’s a good idea to do it every now and again. It is also recommended that you have several cleaning brushes so that you can clean them properly. Free international shipping by registered air mail takes 10-30 days to USA, Canada, UK, Australia and Western European Countries (except for Italy). FedEx/TNT/DHL takes 1-6 business days. The usual handling time is less than 24 hours and most of our items are dispatched as soon as the payment is verified. However, in case of some factors that are outside of our control (such as closed post office), the handling may take up to 72 hours. Test purchase, seems ok Review by Brandon H.